It was a Saturday night in early September. Michael and Yuri were playing on their spaceship-shaped jungle gym in the garden. 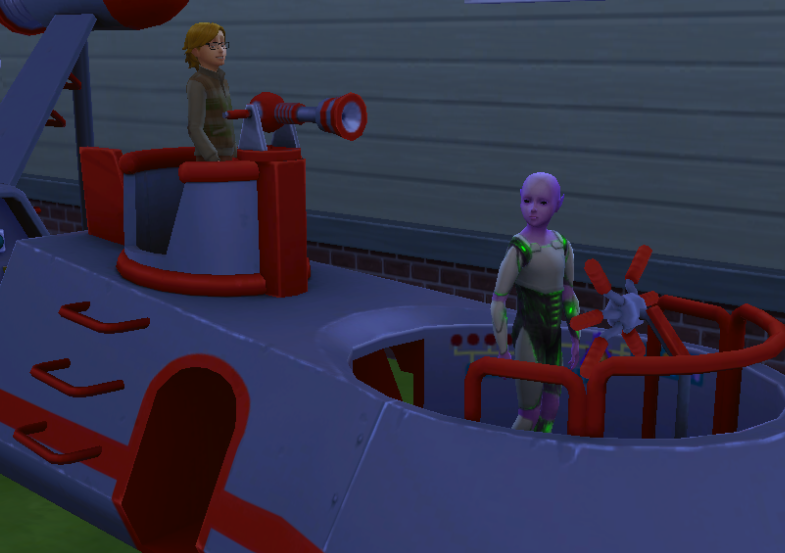 Michael, as usual, was the ship's captain - he was a natural leader, and Yuri, currently manning the ship's laser cannon, was all too happy to follow him. 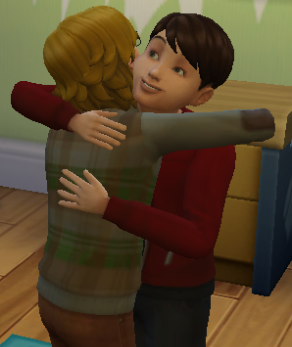 He looked up to his older brother very much, and hoped to be just like him one day. Tonight, however, Yuri wasn't too focused on their imaginary game. His mind was fixed on something even more exciting. "I can't wait to start school on Monday!" he told his elder brother. "Daddy says I'll learn lots of new things, and make lots of friends." "I am quite sure what Father says is true," Michael replied. Yuri chuckled. Michael's way of speaking had always amused him. For as long as he could remember, Michael had never called his parents "Mummy" and "Daddy", like he did. Instead, he called them "Mother" and Father". It wasn't that he loved them any less - that was just how he spoke. His sentences were always perfect and proper, and he never used words like "didn't" or "couldn't". (What had Daddy called them? "Contracttrions", or something like that.) Michael always said "did not" or "could not". It never occurred to Yuri that most humans would find this unusual - that was just the way Michael was. Both boys were fully aware that Michael was an alien. Gabriel and Katerina had decided that it was better for them to know from the beginning, rather than having to deal with problems and questions later on. The fact he was not human really did not bother Michael too much - his parents were still his parents, his brother was still his brother, and he was part of a family whom he loved, and who loved him. Furthermore, being aware of his alien heritage helped Michael understand why he found certain parts of the household's behaviour strange. For example, when Father found something easy, he called it a "piece of cake". That made no sense to Michael at all. Tasks were not cake. Cake was spongy, fluffy and edible. Tasks, generally speaking, were not. If the task involved cake, then maybe the phrase would be plausible, but they did not. Therefore, the phrase was not accurate. Still, that was what Father said. Humans also liked to spend a long time discussing the weather. Why was that? Weather was just a description of the atmosphere and climate at that present moment - it held no special meaning or importance. Yet, humans could make an entire conservation out of it. How very bizarre! That said, being an alien on Earth did have some setbacks. The brothers could only play out together at night, when the darkness hid Michael from the world's prying eyes. Even then, their mother or father would watch them carefully though the window. The family had never been able to go on holiday, or to the beach, or even go shopping together. The limitations also meant Michael could not share his brother's excitement at this present moment. After all - he had never been to school. Instead, he'd been privately tutored by his parents at home. 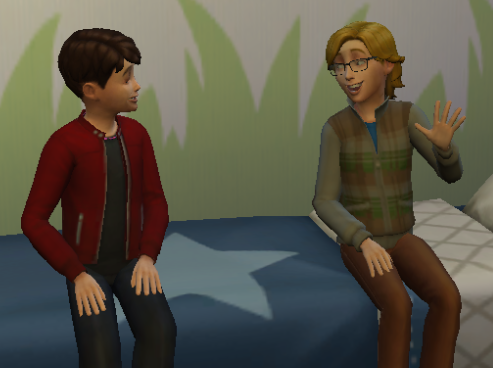 "So, big brother..." he asked Michael, "what's school like?" "I cannot tell you," Michael replied, matter-of-factly. "I have never been." "Never been?" Yuri cried, shocked, "Why not? Don't you get in trouble if you don't go?" "Most children do, but I do not," Michael said. "Mother and Father will not permit me to go to school. They give me all the lessons I require." "So... you've never been in a school assembly?" Yuri asked. "Or had milk at playtime? Or played Tig in the playground?" "No, brother - I have not." "But... but that's not fair!" he wailed. "You're really smart, Michael! You'd be top of the class and get loads of stickers! And I'd bet you have lots of friends, too!" Michael froze. Not being able to go to school had never bothered him before, but now... with Yuri going... it did suddenly seem unfair. Why should he be treated differently to his younger brother? In a flash, Michael had climbed off the the jungle gym, and was heading into the house. Yuri watched him go, confused. "Hey! Don't you wanna play anymore?" he called. "Of course I do," Michael told him, reassuringly. "But I must speak with Father first." "No, Michael. You can't go to school with Yuri on Monday. And that's final!" Michael's sudden request for a formal education surprised Gabriel very much. Did the boy feel he wasn't learning enough? Gabriel had taught him almost everything he knew, and Michael, with his amazing brain, had soaked it all up like a sponge. He was an exceptional child. One evening, Katerina had found him reading a Russian phrasebook. When she'd asked him why he was doing this, Michael replied that he intended to be fluent in Russian by bedtime. When Katerina pointed out that he had to be in bed in one hour, Michael had simply smiled and said, "In that case, I will try to learn Japanese, too." And, sure enough, the next day, Michael and his mother had a long conversation in Russian over breakfast, and then he translated an undubbed anime TV show for his brother. Michael was undoubtedly, a genius - he had no need for school. True, he had trouble understanding idioms - Gabriel had quickly learned that using the expression "like shooting fish in a barrel" was a bad move when there was a toy gun and a fish tank in the house - but time and experience were the answer to that, not a classroom. "Father, I am most grateful for the education you have given me," Michael said, as they sat discussing the matter in his bedroom. "But... I want to know what it is like to have a normal life. I wish to go to a normal school, to play games, to make friends. All my life, I have never been allowed to leave this house - and I do not see the reason why." Gabriel sighed. This wasn't going to be easy. "Son," he began, "your mother and I love you with all of our hearts. But... we are not the same as some other human beings. Our species, in many ways, is flawed. Some of our number fear, or are mean to, people with skin of a different colour to their own, for no good reason at all. Others dislike people who love humans of the same gender to themselves - even though, again, they are doing nothing wrong. We are making progress, slowly... but there is a still a long way to go before we can call ourselves an equal society. If humans can't even deal with each other, then they'll certainly struggle to deal with an alien. I know it's wrong and unfair, my son, but... if you go out there, into the big wide world, then you will face people who will want to hurt you - maybe even kill you." "Yes - I'm afraid so. Worst of all, someone - maybe even a scientist, like me - might try to take you away from us, so they can lock you up and study you, like some sort of specimen. And if you were even taken from me... I'd die." "Yes, Michael. I would be in so much pain, my heart would break. I love both you and Yuri so much - I couldn't live another day if anything happened to either of you." "Son," Gabriel continued. "I understand what you are saying, and I sympathise. 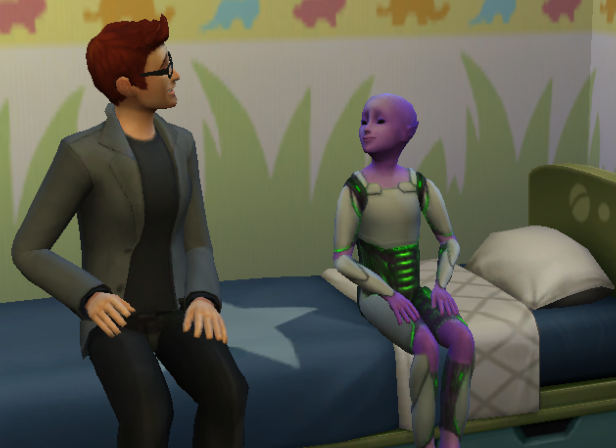 Although I want you always to be proud of who you are... if there was some way we could hide the fact you were an alien, even just for a few hours each day, then of course I would let you go to school. But, the sad fact is, we can't... so it's best for you to stay here, where you are both safe and loved. I... I hope you understand." "Yes, Father," he said. "I understand." "Thank you, Michael," he said. "Now, go to sleep - it's past your bedtime." 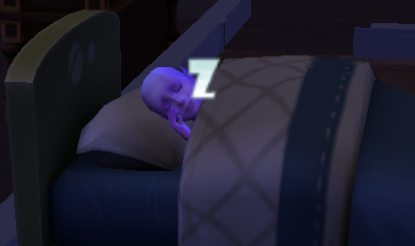 That night, as Michael slept, he had the strangest dream. It started with his wristwatch - a birthday present from his parents - hovering in front of his eyes. Then, he heard a kind, gentle voice calling to him. "Dear Michael... you can have a normal life. I will show you how." Plans and blueprints flashed up before Michael's eyes - complex and intricate designs. His mind whirled as he took everything in. The voice spoke again. "Remember these, Michael. And remember me. I am always with you. Now, go forth and be happy." When he awoke the next morning, Michael instantly knew what he had to do. He seized his wristwatch from his bedside table, dug his father's tools out of the corridor cupboard, and set to work. 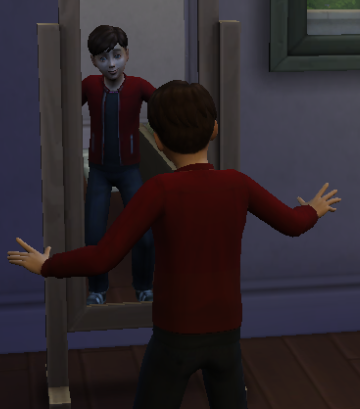 That evening, Michael stood before his parent's bedroom mirror, looking at his reflection. His father had been right - his pointed ears, dark eyes and purple skin would unnerve even the most accepting of humans. However, thanks to his newly modified wristwatch, he hoped that would no longer be a problem. Nervously, he pressed the small red button he had added to the side of the watch's face, his gaze still fixed on his reflection in the mirror. Almost at once, Michael's body began to change. The transformation was painless, but substantial. Once it was over, Michael looked at the new him - and could hardly contain his excitement. "Wow!" he gasped. "Look at me!" The points of his ears had shrunk away. 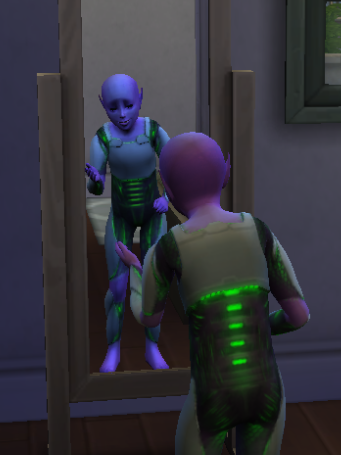 His purple skin had become a peachy colour, like that of his parents and brother. His eyes had developed pupils and irises. His spacesuit had warped into more standard attire. Finally, his alien baldness had been replaced with a fine thatch of brown hair - a similar shade to his father's. In short, he looked completely human. When Michael pressed the button again, he turned back into his alien self. He pressed the button a few times, and found that he could easily switch between the two versions of himself at will. 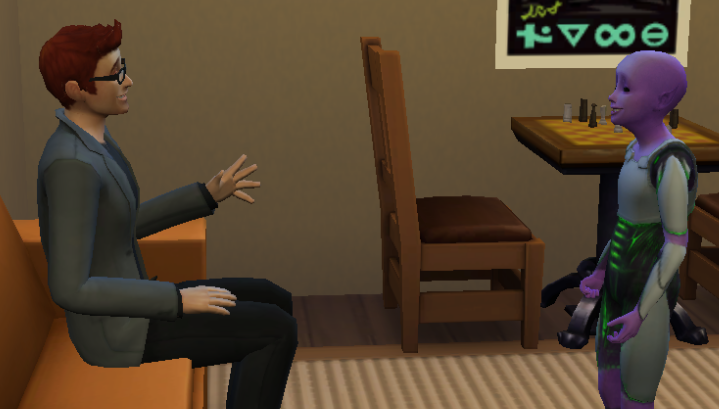 Laughing, Michael returned to his alien form, and raced into the living room to speak to his father. Gabriel was sat on the soda, quietly reading a book, when Michael suddenly rushed in, jumping up and down as if he'd just eaten a whole bag of sugar. "Father! Father!" he cried. "I have something I need to show you!" "All right, Michael - calm down!" Gabriel replied. "What do you need to show me?" Michael struck a little pose. "Now, Father..." he asked, "what do I look like right now?" "My wonderful alien son, Michael, whom I love very much." came the reply. "Very well, then..." Michael said, and he pressed the button on his watch, triggering the transformation. Gabriel's jaw dropped as he looked at the human boy now stood before him. "Michael?" he asked. "Is... is that you?" "Yes, Father! It is really me!" a familiar voice replied. "I had this dream... and I saw this watch... so I made it, and now - look at me!" 'Ah. So that's where my tools went,' Gabriel though to himself, but he didn't mind one bit. 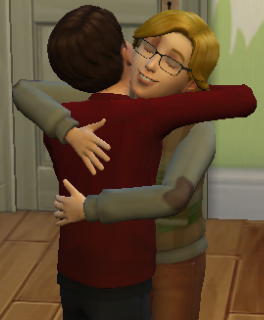 Instead, he ran up to his son and hugged him tightly, deeply proud of his achievement. He called for Katerina and Yuri, who came into the room right away, saw Michael, and marveled at his transformation. "So..." Michael asked his father, "can I go to school with Yuri tomorrow?" Gabriel smiled at him, and nodded. "Yes," he said. "Yes, Michael. Of course you can." It was a happy night for the Lee Harkers. 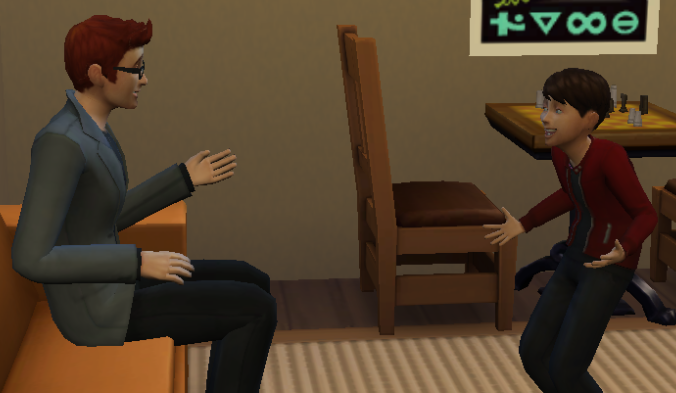 Later on, Michael and Yuri sat together in their shared bedroom, talking about Michael's new look. "You look great, big brother," Yuri said. "You truly think so?" Michael asked. "Sure I do," Yuri replied. "I wouldn't say it if I didn't mean it. But, best of all, now you get to go to school with me tomorrow!" "I will be a class or so above you," Michael pointed out. "That's OK," Yuri said. "At least you'll be there." Smiling, Yuri hugged Michael tightly. Michael hugged Yuri back, just as much. "You're the best big brother in the whole world," Yuri said happily. "You are the best little brother in the whole world," Michael replied. "And nothing is ever going to change that."